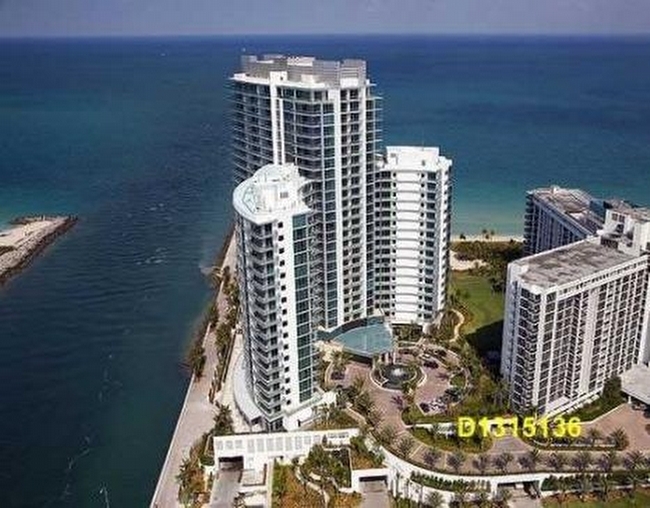 The Regent Bal Harbour Condo Hotel, the hotel component of the adjacent One Bal Harbour, is set on the northeastern tip of Bal Harbour Village, with stunning views over Baker’s Haulover Inlet and the Atlantic Ocean. The first major new hotel to open in Bal Harbour in over a century, The Regent exemplifies everything you would expect from a five star resort. World class amenities include the world renowned Le Institut Guerlain spa, state of the art fitness center, a swimming pool overlooking the ocean, and beachside cabana’s and services. The stylish two-story lobby, complete with Jatoba columns, leather upholstered walls and marble flooring, welcomes upscale business and luxury travel enthusiasts alike. The soothing natural tones, interrupted by just a splash of color, invite and welcome guests into the grand interior. A 26-story tower, which intersects with a pair of 17-story side wings, combines with curved glass facades to create the impression of a ship’s arched and rounded sails. The 750 feet of white sand beachfront complete the luxurious resort setting. The Regent Bal Harbour features 124 Studios and Executive Suites. The guest room designs are enhanced by spacious modern floor plans opening to large terraces to capture the dramatic panoramic views. Beautiful mahogany parquet floors, granite stone, and leather accents and detailing throughout the luxurious interiors convey a warm and seductive atmosphere. Each guest room has a cleverly concealed “Powder Room” whose exterior walls offer only a hint of a door handle to reveal that something is within. Original artwork and personal touches such as tables topped by candles, orchids and silver photo frames create a comforting residential quality. The one-bedroom, one-bath Studio Suite condos are perfect for those who enjoy pampering themselves with room service. The larger Executive Suite condos have terraces on both ends of the residence and feature fully equipped kitchens, spacious living rooms and a master suite with a private terrace. Both of these condo hotel residences can be made available for rental through Regent’s innovative and flexible rental program. The Regent Bal Harbour is ideally located within minutes from Miami’s most upscale shopping and dining experience, the Bal Harbour Shops, and is within 20 minutes to the diverse attractions of South Beach. Miami International and Fort Lauderdale airports are less than 30 miles away. 42" flat screen TV, DVD, CD player, Nakamichi Sound Space 8 1/2 full surround sound system, along with broadband wireless internet access in all guest rooms. An additional TV is incorporated in the bathroom mirror. Flat-screen plasma televisions (52") are featured in Suite living rooms. AMAZING RITZ CARLTON BUILDING. 2 BEDROOM, 2.5 BATHROOMS WITH OCEAN AND BAY VIEWS. STAINLESS STEEL APPLIANCES, GRANITE COUNTER TOPS, PRIVATE ELEVATOR, INFINITY TUB, SEPARATE SHOWER, IN MIRROR TV, FLOOR TO CEILING WINDOWS, 2 TERRACES, 24 HOURS VALET PARKING, 2 HEATED POOLS, ROOM SERVICE, CONCIERGE SERVICES, RESTURAN T, SPA, PRIVATE BEACH SERVICES. PARTICIPATION IN HOTEL LEASSING PROGRAM IS AVAILABLE, NOT MANDATORY. TREMENDOUS SAVINGS OFERRED BY OWNER COMPARED TO RITZ CARLTON RATES; CAN BE RENTED DAILY, WEEKLY, MONTHLY; CALL LISTING AGENT FOR RATES AND AVAILABILITY. ENJOY EXPANSIVE VIEWS OF THE OCEAN, BAY AND BEACH FROM THIS 10TH FLOOR 2 BEDROOM /2,5 BATHROOM SUITE WITH 2 WALLS OF FLOOR TO CEILING GLASS FOR DOUBLE EXPOSURES IN THE LIVING ROOM; TREMENDOUS SAVINGS OFERRED BY OWNER COMPARED TO RITZ CARLTON RATES; MASTER HAS 1 KING SIZE BED; 2ND BEDROOM HAS 2 QUEEN SIZE BEDS; SUITE CAN BE RENTED DAILY , WEEKLY,MONTHLY-CALL LISTING AGENT FOR RATES AND AVAILABILITY.